Not human bean, more than a human been! Dachshund (German, “badger dog”), breed of hunting dog (classified in the hound group) having short legs, a long body, and long ears. Originally developed in Germany, dachshunds were used to drive badgers from their holes, which the dogs could enter because of their short legs. Seldom used for hunting today, dachshunds are valued as pets for their bravery and good disposition. They have short hair, are tan or tan and black, and have hound-like heads. Dachshunds are very popular in the US, ranking 6th in terms of the number registered with the AKC. This breed has become synonymous with Germany. In fact, they are so closely associated with this country, that a Dachshund was the official mascot for the 1972 Summer Olympics, held in Germany. Dachshunds are playful, fun dogs. In fact, they can be much more loyal than other kinds of dogs. Dachshunds have deep and tender eyes, and that dachshunds have many facial expressions and dachshunds can communicate just with the look on their faces. 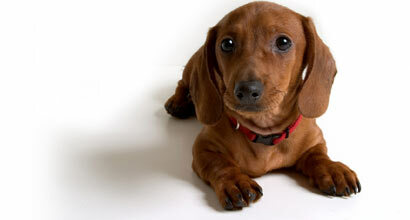 Dachshund is generally an energetic dog, a healthy Dachshund can live as long as 16 years. Ideal pet for many homes, including those with children with appropriate supervision. The Dachshund is clever, lively, courageous with lovable and dependable temperament. They have an intelligent expression and carry themselves proudly. "A dog has no use for fancy cars..or big homes or designer clothes. A waterlogged stick will do just fine. A dog doesn't care if you are rich or poor..clever or dull, smart or dumb. Give them your heart and he'll give you his. Haw many people can make you say that above? How many people can make you feel...extraordinary?" from the movie: "Marley & Me"
Dachshunds are referred to by many different names: wiener dog, frankfurter, German sausage dog or hot dog. Some people spell their name dachshunds, others spell it doxsunds, but the correct spelling is dachshund, which is German for badger dog, except the name for this special breed in Germany is a Teckel in Northern Germany, and a Dackel in Southern Germany. Dachshunds are playful, fun dogs, known for their propensity to chase small animals, birds and tennis balls with great determination and ferocity. Many dachshunds are strong-headed or stubborn, making them a challenge to train. Dachshunds may dig holes in the garden, or chase small animals such as birds, squirrels, or lizards. They have a particularly loud bark, making dachshunds good watchdogs. Dachshunds are known for their devotion and loyalty to their owners, though they can be standoffish towards strangers. If left alone many dachshunds will whine until they have companionship. Some dachshunds are prone to separation anxiety and may chew objects in the house to relieve stress. Dachshunds are manipulative, independent dogs that given the opportunity will win the hearts of anyone. Copyright © 2008 MyDachshunds.info | All rights reserved.